War Torn Heart by Allison Wells is a wonderful YA historical Christian novel that takes the reader through the homefront in America during WWII. The heroine is just sixteen years old but already a strong young woman who wants more than just a traditional role. “You’re a strong, godly woman who should always look up.” We need to focus on God when circumstances threaten to overwhelm us. Dreams and future plans are disrupted by WWII. Life is on hold. Young men are entrusted into the hands of God as they go off to war. War tears families apart. “Why do You allow this?… Can’t You hear all of us praying?” God does not ‘allow’ war. God gave free will to man. It was the choice of some men to go to war. Good men stood up to fight evil. I am considerably older than a YA but I really enjoyed this book. It was a delight to watch characters grow and develop and to witness their dreams and love. Close knit families and friendships helped to overcome the horrors of war. A very warm coming of age and overcoming novel. 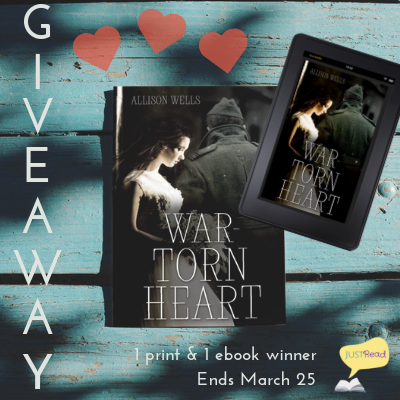 Welcome to the Blog & Review Tour – and Giveaway – for War-Torn Heart by Allison Wells, hosted by JustRead Publicity Tours! 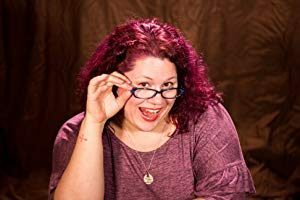 Abigail Walker, a young woman from rural South Carolina, is on the cusp of womanhood, aching to be able to run wild as the younger children do, yet yearning for things she has yet to understand. Awkward and unsure of herself, Abby is flustered when she meets Harvey Nicholas, a cadet from Clemson College. As summer begins, Abby finds herself constantly in the company of Harvey and falling quickly in love with him. As rumors of war begin to reach the States, Abby begins to fear what may come for her older brother and Harvey. Once Pearl Harbor is bombed, the boys are eager to protect their home and the women they love. But will Abby and Harvey’s love be able to withstand distance, rumors, loss, and hurt? Or will the war be what tears apart Abby’s heart? 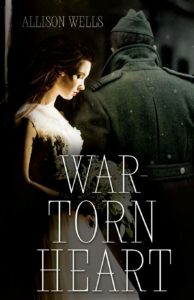 War-Torn Heart is a kleenex-box book with a story of hope, of love, and of perseverance through World War II, which will make the reader cry, scream, and long for more. Allison Wells is a new author, but for the most part she’s a Southern wife and mother. With four active children, she spends most of her time in the car, but when she can she loves to sit down and read or write. Allison is a graduate of Clemson University in the beautiful foothills of South Carolina and she still lives close enough to hear football games on Saturdays. Enter via the Rafflecopter giveaway below. Giveaway will begin at midnight March 18, 2019 and last through 11:59 pm March 25, 2019. Void where prohibited by law. Winners will be notified within 2 weeks of close of the giveaway and given 48 hours to respond or a new winner will be chosen. Thank you so much for the kind review! God bless! I’m really looking forward to reading this story!